Bed bugs pictures can help you identify whether you have bed bug bites and in turn whether you have a bed bug problem to deal with. Unfortunately, bed bugs are becoming an increasingly common problem, whether in your own home or in hotels and other places. Bites on the body, often noticed after waking, are often assumed to be bed bug bites but this is not always the case as many other insects may be responsible for the marks on your skin. Bed bugs pictures can be used to identify your bites. First, some general information about the bites is useful as well. Bed bugs can bite any skin part of the body but exposed skin areas are usually bitten more frequently. In particular, these areas are the face, neck, arms, hands, and lower legs. This is usually the most obvious indication of a bed bug problem. Bed bug bites are often in a cluster pattern of small hives which are red and itchy. To see an example of bed bugs pictures see the image below. This image can be used to diagnose whether you have a bed bug infestation problem or not. Not that the image is magnified and often you will have to look very closely to find and identify the bugs. Bed bug bites are to put it bluntly disgusting to almost all who have had them. Although the look of the bug bite is not in itself revolting, the fact that bugs are residing where you sleep makes one feel stressed and uneasy and extremely uncomfortable. The main bite symptoms on the skin from a bite of a bed bug are reddish bites, generally small in size and often in some sort of cluster formation. The bites are sometimes described as small hives. They are itchy and are generally noticed in the morning because the bed bugs feed at night while you are sleeping. These bites are usually found on unprotected or unobstructed areas of the skin. Therefore, the face and neck, hands and wrists, lower leg areas, and any part not covered with sleepwear are readily available bite targets for the bed bugs. 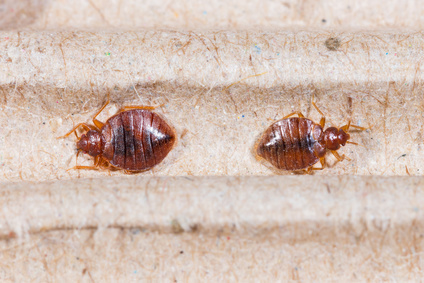 It is sometimes difficult to determine that you have a bed bug problem and once you do, it is often very difficult to completely eradicate the bedbugs. For many individuals, bed bugs can be a very annoying and frustrating problem to deal with. Discover several effective and safe methods to get rid of bed bugs in your home. Learn about all the different species of bed bugs that exist so that you know how to deal with them. Discover exactly what bed bugs are and how to prevent them from getting into your bed and home and biting you. Find out how to properly identify them. Learn about the all important health hazards associated with bed bugs. How to properly discover if you have bed bug issues in your own home. Learn the favorite hiding places for these bugs and how to find them. Discover how bed bugs travel from place to place and how they are able to get into your home in the first place. You may be surprise how they actually appear. Learn some information about the life cycle of the bed bug, which is important to know when trying to eliminate your bed bug problem.